Plant Based Bride did an excellent video review of the Rhodia Webnotebook, which she used for bullet journaling from January through September of this year. She did a very thorough review of what she loved about the notebook, and what she didn’t love about it. She noted that the paper is a huge step up from other brands, and that you can even use watercolors on the pages. See her entire review and her verdict here! 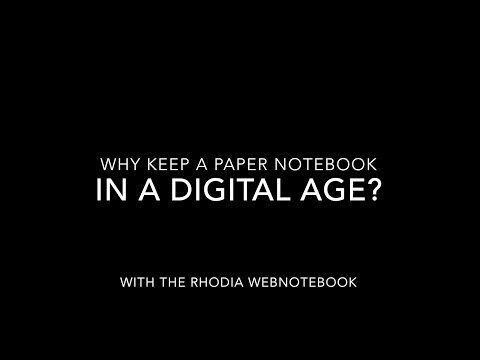 You can see more information about the Rhodia Webnotebook series of notebooks here. The Webbies come in A5 and A6 sizes in portrait orientation and reporter-style, or in A5 Landscape orientation. The notebook she shows in this video is the A5 size Rhodia Ice Webnotebook with dot grid pages. If you like everything about the Webnotebook but want other cover color options, check out the Rhodiarama notebooks with hard covers or soft covers. And if you like these notebooks but want bullet journal specific features like numbered pages, Index and Future Log pages you’ll want the Rhodia Goalbook. These notebooks make great gifts for the bullet journalers, writers, and artists in your life! Or treat yourself as a step up from your current notebook.